This article from today’s New York Times tells of two friends who have spent two years putting together a map of the trees in Central Park, New York. Of the approximately 23,000 trees in the park, only about 150 remain from the era when the park was first designed and planted (mid nineteenth century). Wish we had a map like this for Golden Gate Park! What a great gift to the public! “Ken Chaya and Edward Sibley Barnard are not like most people. Spend two hours walking the oxygen-infused oasis with this pair as quirky as the Quercus prinus (chestnut oak), and it’s as if all of your senses are on steroids. You smell the fresh wintergreen scent of a sweet birch branch split open. You pick up a crusty pod from the Kentucky coffeetree and taste the molasses-like jelly inside (but not the seeds, which can be toxic if they are not cooked). You run your hands over the winged branches of the Euonymus alatus and they feel like cork. You are mesmerized by the magenta leaves glowing atop the variegated European elm because of a beautiful defect. You hear a magnolia warbler chirping on a black cherry tree deep in the serenity of the woods. And then you begin to understand the pure wonder that drove these two men to give up two and a half years of their lives to make a map that artfully and painstakingly details 19,933 trees in Central Park. Their map includes 174 species and represents about 85 percent of the vegetation on the park’s 843 acres. The pair, working independently from the city and without any subsidy from the Central Park Conservancy, the nonprofit organization that manages the park, said they had spent nearly $40,000 on the project — testing their families’ patience — because they cherished Central Park’s trees and wanted others to as well. They hope to just break even. 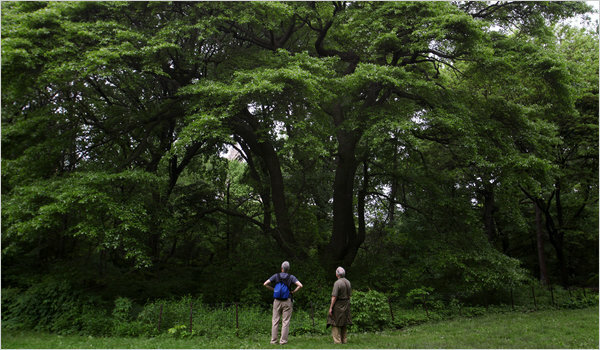 via 2 Enthusiasts Compose Map of Central Park Trees – NYTimes.com. This entry was posted in plants, trees/urban forest and tagged golden gate park, urban forest, urban parks. Bookmark the permalink. I saw this article in the Times this morning. Being a tree lover I was, of course, very interested in it and it raised some questions in my mind. How does the life expectancy of the trees in Golden Gate Park compare to that in Central Park? Only 150 of over 23,000 trees in Central Park have been there as long as the park (1862). Have we experienced that high tree turnover in GG Park? I was astounded that they have had two deaths-by-tree and one serious brain injury in two years. We haven’t had a tree death since 2008. The redwood branch in Stern Grove that killed a young woman in 2008 had been identified as hazardous by a certified arborist 5 years before this fatal accident. So, what does that say–if anything–about tree inspections in Central Park? Are we actually doing a better job at inspections (and apparently a less good job at then acting on those inspections)? They seem to have greater diversity of trees in Central Park than we do in GG Park. If so, why? Is it harder to grow trees in San Francisco because of the climate? Thanks for bringing this interesting article to the attention of your readers. It is a thought provoking article.